Over the past two years 800 members of the astrobiology community have contributed, through in person meetings, white papers, a series of webinars and reviews, to define a new strategy for the next decade of astrobiology research. Mary Voytek, the Senior Scientist for Astrobiology, and Michael New, the Astrobiology Discipline Scientist, described the goal of the endeavor to create an "inspirational and aspirational" document. The strategy will replace the 2008 Astrobiology Roadmap. Over the past two years 800 members of the astrobiology community have contributed, through in person meetings, white papers, a series of webinars and reviews, to define a new strategy for the next decade of astrobiology research. Mary Voytek, the Senior Scientist for Astrobiology, and Michael New, the Astrobiology Discipline Scientist, described the goal of the endeavor to create an \"inspirational and aspirational\" document. 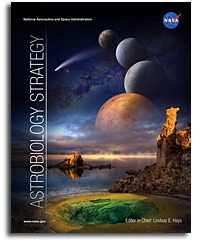 The strategy will replace the 2008 Astrobiology Roadmap.